A polymer modified cementitious levelling coat with built in flexibility and waterproofing characteristics. Application should be carried out by either brush or trowel. 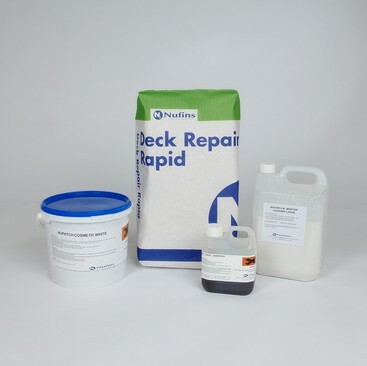 Ideal for the treatment of repaired concrete surfaces to protect the unrepaired areas against further attack by chlorides or carbonation and to provide an overall uniform appearance or a consistent surface to receive a decorative coating. Nucem Skim Coat is a waterproof material which allows the structure to breathe. Independently tested by Taywood Engineering Limited. Nucem Skim coat is designed to conform with the requirements of EN 1504 Part 2. Waterproofing of internal and external concrete, brickwork and blockwork. Protection of concrete with insufficient cover to steel reinforcement. Unification of repaired concrete structures. Damp-proofing of basements and cellars. Provides an efficient barrier against ingress of Carbon dioxide. Easy to apply by brush or float. Good resistance to water, frost and salt. Pack contains everything including gauging liquid. Conforms with the requirements of EN1504-2. To download the Nucem Levelling Coat Technical Data Sheet click here. To download the Nucem Levelling Coat Safety Data Sheet click here.